With more than two-thirds of the world’s population projected to live in cities by 2050, sustainable development increasingly depends on the successful management of urban growth. To that end, Planet is announcing today a groundbreaking R&D project with the World Bank to pioneer new tools to detect urban change in emerging countries, beginning with Dar es Salaam, Tanzania. The project falls under the Tanzania Urban Resilience Program, funded by the United Kingdom’s Department for International Development (DFID). Dar es Salaam is one of the largest and fastest-growing capital cities in East Africa. Research suggests the city is growing at a rate of 8% to 12%, but this is difficult to confirm, as much of the growth is unplanned and unmapped. Rapid urbanization combined with poor planning often carries substantial risk to infrastructure, public health, clean water provision, natural habitats and ecosystems, and social stability. 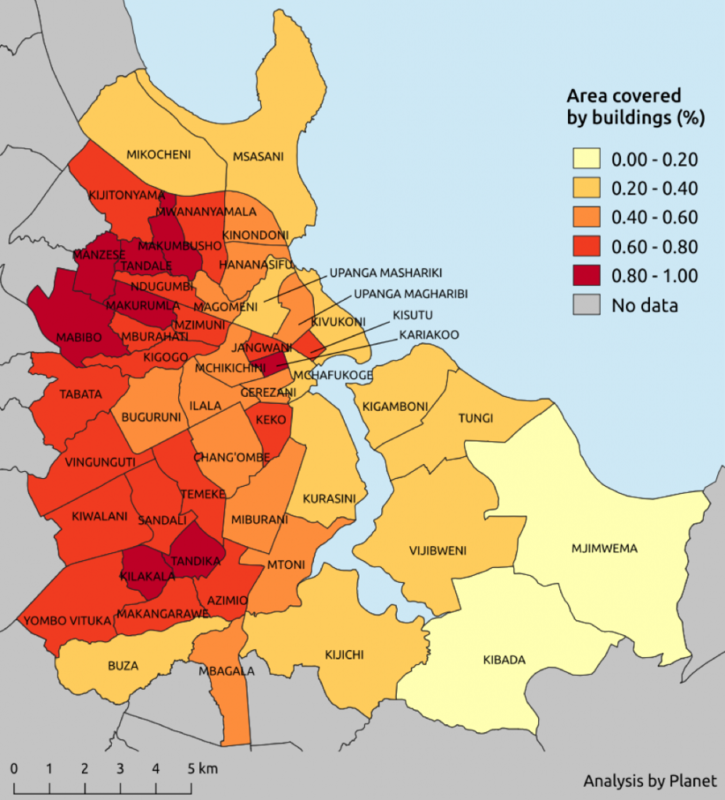 To pilot new solutions to development financing and urban planning, Planet and the World Bank leveraged Planet’s frequent high-resolution satellite imagery, ground truth data from the community-based initiative Ramani Huria (Swahili for “Open Map”), and advanced deep learning techniques to automatically detect building development in Dar es Salaam as well as measure urban density. The project was comprised of two applications: one for automatic detection of building footprints and the other for measuring building height. Combined, these two indicators help provide an understanding of Floor Space Index, which governments, NGOs, and international development institutions use to understand how much land is available for development and to determine what is planned and unplanned. Planet trained a convolutional neural network architecture to detect building footprints in PlanetScope imagery (shown in blue below). The high refresh rate of the Dove satellites, with the ground truth data from Ramani Huria (shown in yellow), yielded accurate results, as you can see in this image. The high accuracy of this automated model is expected to only further improve with future refinement. The Ramani Huria project (Swahili for “Open Map”) is a community mapping project that provided critical ground-truth data used to train the building detection model. Building detections from the model trained on PlanetScope imagery. Note that the blue detections over the yellow ground-truth data shows the precision of the model. Planet partnered with Toyon to do stereo 3D reconstruction techniques on two high-resolution SkySat images to measure building height. The images are captured at different off-nadir angles and taken on the same pass of one satellite 45 seconds apart. When plotted in 3D (below), the result is a plausible 3D model of downtown Dar es Salaam, with near-straight vertical edges on the tall buildings. Dar es Salaam skyline projected into 3D using a pair of SkySat images, shown here from two directions. 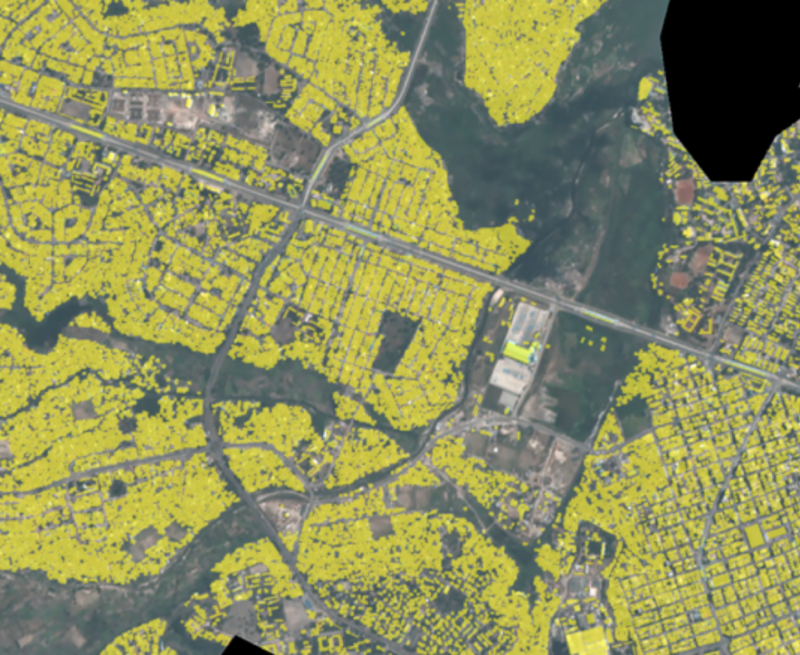 Combined, these two analytic feeds – leveraging PlanetScope for detecting building footprints and SkySat for vertical growth – provide an understanding of where population growth is concentrated and the nature of that change. Ultimately, this helps inform more resilient, sustainable, and inclusive urban planning policy and finance. A map of building density in Dar es Salaam using the building detection model on PlanetScope data from August 2017. 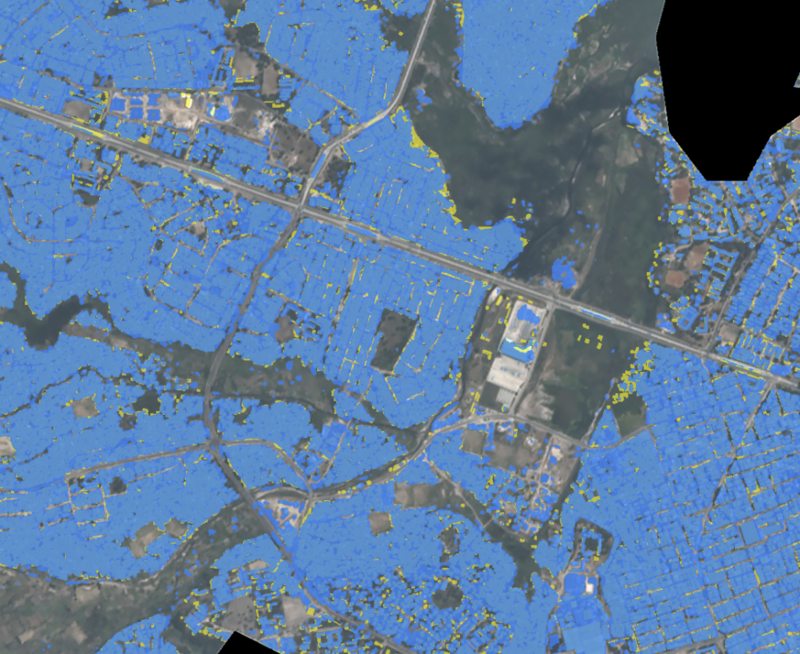 Looking ahead, Planet and World Bank are exploring improvements to both the building footprint and height analyses, as well as adding high-frequency time-series within the application. As they continue to refine the models, Planet and World Bank are also looking at ways to expand the scope to include other geographies and tailor the application for local solutions. Planet will present the project at the URTZ 2018: Understanding Risk Tanzania conference, part of FOSS4G, in Dar es Salaam, Tanzania, on August 29.